By most measures, 2018 has been a solid year for U.S. investors. Including dividends, the S&P 500 has generated a 10% total return in the first three quarters of the year. However, trading volatility has steadily increased throughout 2018 and the Fed just enacted its third of an expected four interest rate increases this year. Sprinkle in some cautionary economic headlines coming out of Europe and the chances are increasing that stocks could experience a pullback between now and the end of the year. Rather than worry or panic about any selling that could materialize in the near term, I’ve created a list of low-dollar stocks with secure dividends that could weather any potential storm. Stocks Under $10 are often ignored by dividend investors, because they tend to exhibit higher volatility— but if you’re selective, some good hidden values can be found in this corner of the market. Apollo Investment Management (AINV) is a business development company (BDC) that invests in the debt and equity of businesses in various industries. The company’s $2.5 billion portfolio is spread across nearly 100 investments. About 84% of the holdings are in secured debt and 94% of those are floating-rate, which protects future profits from a continued rise of interest rates. 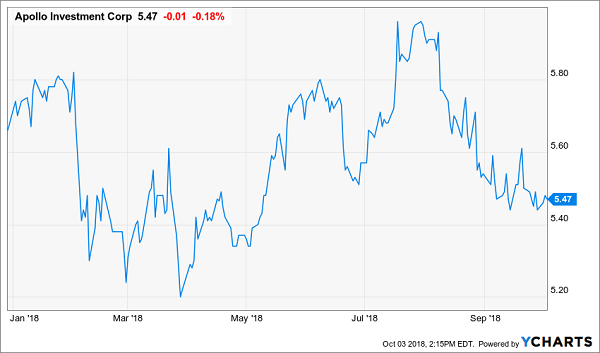 What stands out first about Apollo Investment is that it trades at a 15% discount to its net asset value (NAV) of $6.47, which should help serve as a floor for the stock. The company’s NAV has stabilized in recent quarters, as management has reduced the exposure to non-core assets (including oil & gas, structured credit and shipping) to just 17% on the investment portfolio, from 35% two years ago. In the meantime, Apollo Investment pays a quarterly dividend of $0.15 a share (10.9% yield) that has been stable for the past couple of years. The company has a clean balance sheet and its bonds carry an investment-grade rating. It’s also an encouraging sign that management sees value in the shares and bought back $8 million worth in the second quarter. FS Investment (FSIC) is another investment-grade BDC with a double-digit dividend yield that should hold up relatively well when the next market pullback comes. Like Apollo Investment, the company trades at a 20% discount to NAV and management bought back $50 million of stock earlier this year. FS Investment stands alone in that it’s growing the business through a pending merger with Corporate Capital Trust (CCT). The deal is expected to close by the end of 2018 and create the second largest public BDC, with $8 billion of investments across more than 200 holdings. The combination of the two businesses should generate at least $5 million of annual cost synergies. More importantly, the increased scale will likely allow the company to raise future capital at lower rates. While management did lower the quarterly payout to $0.19 (10.7% yield) a share last year, FS Investment’s outlook has improved following the Corporate Capital merger and annual profits are expected to average 5% growth through 2020. Taking a step back from the deep-discount BDC’s, Spirit Realty (SRC) is a net-lease REIT that has transformed itself in 2018. Under the net-lease structure, tenants usually pay for building updates and maintenance. Back in May, the company spun off Spirit MTA REIT (SMTA), which held 40% of its previous assets, but generated just 10% to 15% of adjusted funds from operations (AFFO). Now that management has separated the wheat from the chaff, Spirit Realty is left with a portfolio of over 1,500 properties with a 99%-plus occupancy rate that should generate consistent future growth. The company has guided for 2018 AFFO of $0.68 to $0.69 a share, which would comfortably cover the quarterly dividend of $0.125 (6.3% yield). In addition, management bought back $64 million worth of stock in the second quarter and is authorized to repurchase another $250 million over time. It’s important to have a shopping list for potential market storms that loom on the horizon. 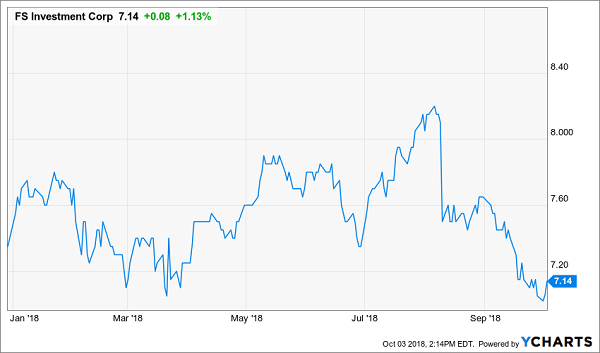 Some worthy dividend investments do reside in the universe of stocks under $10 and it’s particularly noteworthy when a company repurchases its own shares. However, it sometimes takes a while for a company to transform itself or a stock to trade back up toward its NAV, if at all. 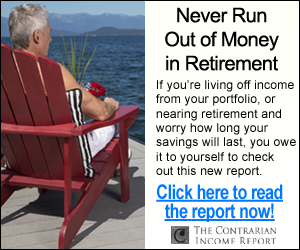 Besides, when you’re nearing retirement or already retired, all you really care about is generating consistent income and protecting your hard-earned nest egg, whether the broader market is up 10% one year or down 10% the next. The good news is: there’s a better way. My colleague Brett Owens has created an “8% No-Withdrawal Portfolio” that generates steady income and impressive capital gains. Whether you’re already retired, or looking to augment your paycheck with the passive income that dividends afford, you no longer have to choose between measly 2% to 3% yields from dividend “aristocrats”, government-secured interest payments that barely keep up with inflation or wading into the volatile waters of low-dollar dividend stocks. Wall Street has tried to address this issue with structured products, such as single premium immediate annuities (SPIAs). But just like the casinos don’t pay for all the glitz and glamour because gamblers usually win, the big financial service firms charge hefty fees to provide you with that steady income. Closed-End Funds (CEFs)- We’ll share our top three CEF picks with you, each of which pay a monthly dividend. Many of these trade at a discount to net asset value, like Apollo Investment and FS Investment. Preferred Stock- Brett lets you know two of the best active managers in this space to invest alongside with. 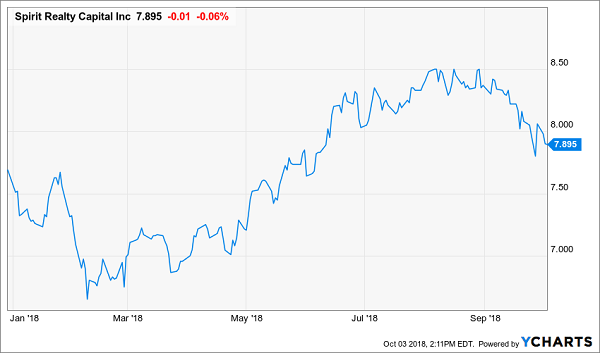 Recession-Proof REITs- discover two REITs that actually benefit from higher interest rates today; rather than waiting for a potential turnaround at name like Spirit Realty. That’s 7 contrarian investment picks just to get started. 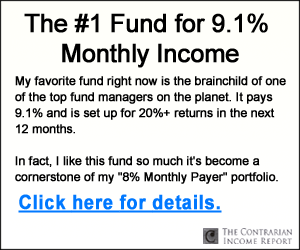 Click here for instant access to the full 8%, No-Withdrawal portfolio.